Addemar Support Knowledge - Importing contacts overview made better! I have imported new contacts, but I don't get an overview who is already unsusbcribed. I want to see whom from my imported contacts is already unsubscribed in my different unsusbcriber groups. The import overview popup, which is the popup where you get an overview of your import, has been improved to also show the already unsubscribed contacts you have imported. How you can import your contacts into our application is described here. Once your import is finished our application provides you an overview of your import. 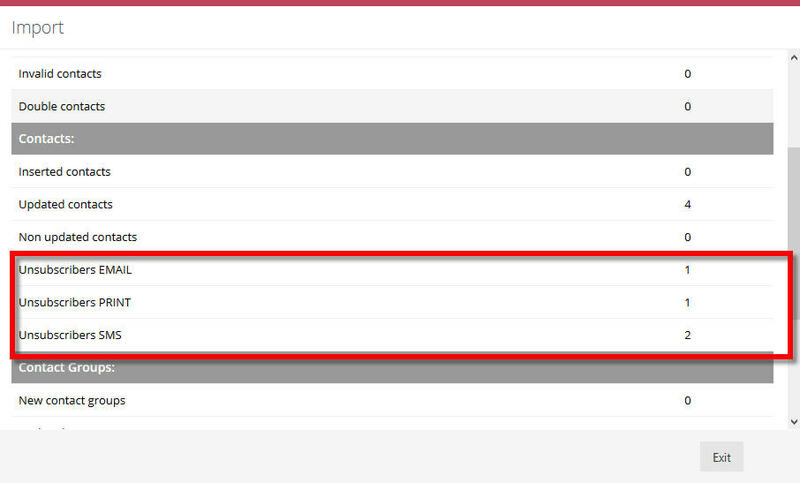 Inside this overview we have made a section which shows you which of these imported contacts where already unsubscribed. As shown in the screenshot, we organize these unsubcribed contacts per unsubscriber group*. *In our application we have unsusbcriber group per channel. If you have SMS and/or PRINT (direct marketing ) activated you'll have these different unsubscriber groups.